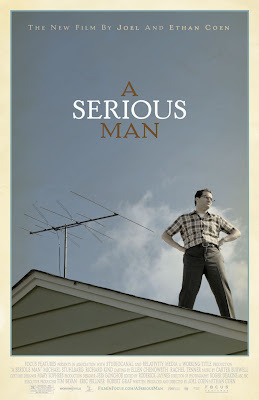 Earlier this evening, I watched A Serious Man, the latest movie from the Coen Brothers (unless you count True Grit, but that hasn’t actually been released yet) for the first time. I’ve been a big fan of the Coen Brothers for quite some time now, and own a number of their movies (for trivia purposes: The Big Lebowski, O Brother Where Art Thou?, Barton Fink, Intolerable Cruelty, The Hudsucker Proxy, Fargo, No Country for Old Men, The Man Who Wasn’t There, Miller’s Crossing and Blood Simple – though I have seen all their other films except The Ladykillers and Raising Arizona), so naturally was looking forward to seeing this movie. 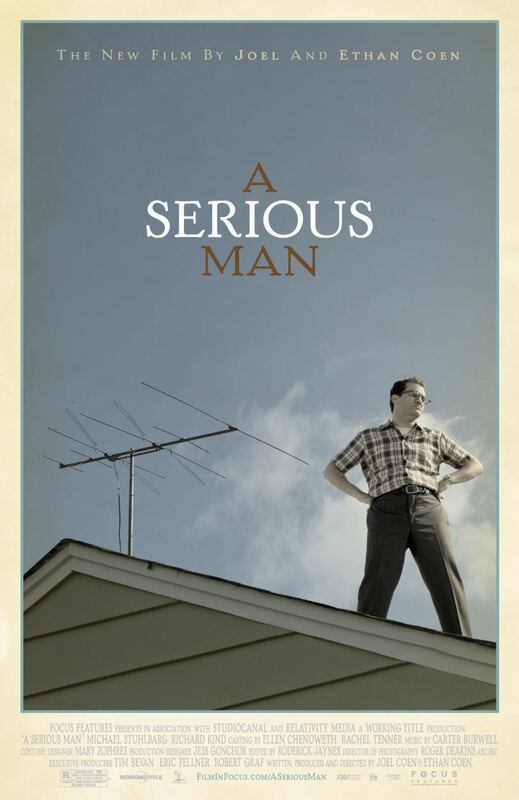 A serious Man centres around the life of a Jewish Mathematics professor, Lawrence Gopnik, and the events that happen in his life over a 2-week period in the run up to his son’s Bar Mitzvah. It is set at some point in the relatively-recent past, but does not specify a specific year. In fact, it feels as though it could be set at almost any time in the last half-century, and this is a really cool effect. Of course, since it features a song by Jefferson Airplane at multiple points, it is probably set in the 70s, but the feeling of ambiguity is nice regardless. In a lot of ways, the film is strongly reminiscent of ‘The Man Who Wasn’t There’, the Coen Brothers’ 2001 movie in which Billy Bob Thorton plays a depressed man who finds out his wife is cheating on him for his boss, and decides to blackmail him as revenge. A Serious Man similarly features a lead who is incapable of understanding other people, forever left dazed and confused by their actions, having increasingly worse things happen to him, yet seemingly not being able to process the events and find the right emotions for them, and finally falling into neo-insanity as a result. The movie often plays on the deadpan style humour of a man just not knowing how to react to different situations, and accidentally making things increasingly worse by simply not reacting at all, and this creates some hilarious scenarios. Father: Yes. And a passing grade. Lawrence: Or... you'll sue me? Lawrence: So he did leave the money? Lawrence: It doesn't make sense. Either he left the money or he didn't. Father: Please. Accept the mystery. As always, the Coens’ dialogue is some of the sharpest and funniest you are likely to hear, and there are a number of incidents in the movie where the performances and dialogue are absolutely fantastic. The movie is one of the bleakest, darkest comedies to come out in a while (probably since ‘The Man Who Wasn’t There’), but still delivers good laughs at regular intervals throughout. The whole piece seems so well put together, as well, and it is nice to see the Coens back on top form with their writing, having slipped a bit with ‘Burn After Reading’, and adapted ‘No Country’ pretty well word-for-word from the book (creating probably the most accurate film presentation of a book since Orson Welles' adaptation of Kafka's "The Trial"). The movie also moves deeper, taking a look at faith itself, and exploring religious imagery, and Jewish culture in an often entertaining and hilarious manner. Lawrence’s experiences talking with numerous Rabbis about his problem, and his conversations with his lawyer are both comedic and revealing, and give the film a deeper, spiritual base, which is important for the ending. Essentially, though, the main theme of this side of the film is that God works in mysterious ways, and even if you do all you can to find meaning in things, some questions will never be answered. This is highlighted excellently with a scene in which one of the Rabbis tells Lawrence the story of a man who came to him looking for meaning in the events that were happening to him, but never reveals what the man found at the end of the tale. The are a large number of other references to religion and Jewish culture within the film that don’t deal with this theme as well, and undoubtedly there are countless things hidden within the story that I missed. For example, there is a scene in which Lawrence is fixing the aerial on his family’s TV, and has to get up on the roof to do this. Whilst he is up there, we see him fiddling with the aerial, trying to make it work, and the hidden reference contained here is, of course, that he is literally “fiddling on the roof”. I suspect that there are numerous other incidences of things like this occurring within the movie, but a lot of them are probably only obvious to those with a Jewish background. Still, even acknowledging the fact that I probably missed 90% of the references, I still really enjoyed this movie, and watching the story unfold. The film is shot incredibly well, as always, although this time round the Coens seem to be playing with the camera a little more than usual, tilting the camera to indicate that we have switched from a story to real life or vice versa, or to signal a change in location. There is also even more soft-focus photography employed in this film than in their other films, with some shots blurring all but the character’s face. Of course, the Coens have been doing this since Miller’s Crossing, and are known to be avid fans of long-lenses, but it is just interesting seeing it being exaggerated further than usual in this film. The blurring between reality and fiction in the movie is also great, with a couple of scenes included that could either be reality or fiction, especially when viewed in conjunction with scenes which we know are imagined or “made-up” by the characters. This blurring of reality becomes significant when we view the end of the movie. But this is where things got strange: the ending of the film. It is so abrupt. We go through the entire film building this story, and as Lawrences family and money problems seem to have resolved themselves, he gets a call from his doctor (who we see him with at the start of the film) telling him he needs to come in to discuss his X-Ray results (“can’t we do it over the phone?” “I think you’d be more comfortable hearing it in person”). We know that this is obviously bad news, and as this scene concludes, we cut to Lawrences son, at school, standing outside and watching a tornado about to hit. The song “Somebody to Love” by Jefferson Airplane kicks in, as it does at 2 points earlier on in the film, and then the screen goes black, and cuts to the credits. It is by far the most abrupt ending to a film I have ever scene, and tops even “The Italian Job” for the bizarre cliff-hanger ending award. Now, I can understand why the film ends like this; it is supposed to represent exactly what the Rabbi was talking about when he told Lawrence the story earlier in the film that did not have an answer at the end: We all search for meaning, but we are not always given answers. However, it just seemed like such a rip-off; we had waited for some kind of pay-off, and then the movie just ended. That’s it, movie’s done. Of course, this was the point they were trying to make about life, but it just felt disappointing. The ending was so abrupt it was almost as though the last reel had been lost, or the Coens had run out of ideas whilst scripting and thought “doesn’t matter, we’ll think of a way to end the script once we’ve filmed it”, and then couldn’t. Unfortunately, the Coens seem to have gotten into a habit now of ending their films abruptly, and without wrapping everything up. ‘No Country for Old Men’ skipped some of the last chapter from the book, missing out what ultimately happens to Chigurh, and the kid who takes his gun from the wrecked car, and ‘Burn After Reading’ just cut from mid-story to the ending scene, explaining everything in a voice over but not tying things up properly, and now this. Whilst No Country didn’t really need those extra scenes, and the abrupt ending to ‘A Serious Man’ does make a very valid point about life, and meaning, it is still frustrating, and honestly did feel lazy. An abrupt ending can be good, but we need our pay-off first. Think about The Long Good Friday; the ending is an abrupt cliff-hanger/twist ending, but since the main part of the story was all wrapped up by the time we reached the ending scene, it fit perfectly. A Serious Man does not end this well, leaving a lot more to be desired, and thus was a very disappointing movie, despite how enjoyable it was for the most part. A very well written often-times hilarious black comedy which I would definitely recommend to anyone who is a fan of the Coens (especially ‘The Man Who Wasn’t There’), but otherwise would suggest you don’t watch. This film is incredibly well made, and very well written, but the ending is such a disappointment I just don’t feel I can give it 4 stars, no matter what point it may be making with this ending.